You know what they say -- rules were meant to be broken! As a bride that might be a little hard to feel okay about; after all, many wedding traditions have been around for centuries, and some more "proper" guests and family members might not be on board with ditching traditions that they find essential to a wedding. But you know what, brides? It's time to break some rules and blaze new wedding trails. Especially when in the scheme of things, many wedding traditions can be quite trivial. Who will really care and remember if you had five bridesmaids and three groomsmen? And we promise, Aunt May won't keel over and die if you don't freeze the top layer of your wedding cake for the anniversary. Lauren Conrad, who's positioned to be the modern girl's new Emily Post, has a few thoughts about wedding rules you can break for the big day. With her wedding in the works, you can bet that her fete will be a completely classy wedding, sprinkled with modern touches. 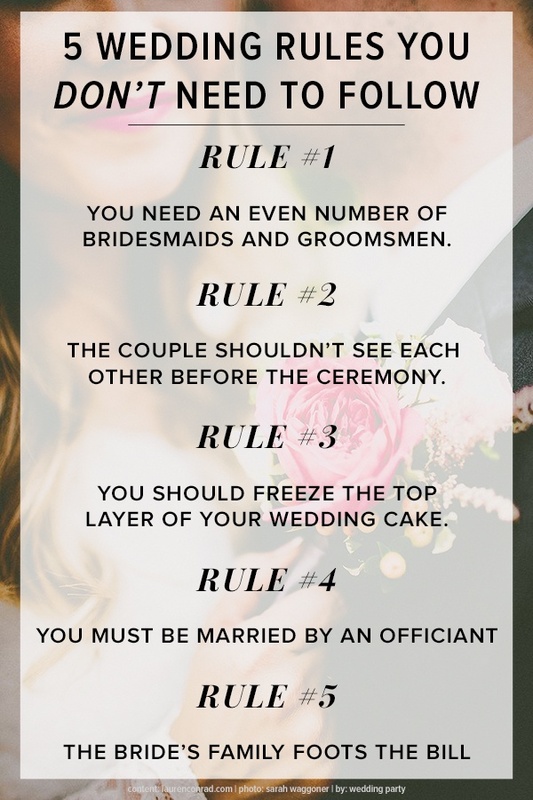 And we totally agree with her most recent post on the 5 wedding rules that are okay to break. What do you think of ditching these 5 traditions for your own day? Which rules will you follow and which rules (if any) will you break that are not highlighted here?